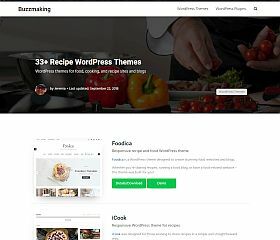 Tasty Recipes is one of several plugins offered by WP Tasty that was designed specifically for food blogs and recipe sites. A robust, full-featured plugin, it has been optimized for SEO (Schema.org/rich snippets), can be styled to match your site, the ability to support ads for monetizing, and a handful of other features that give you a complete solution great for any website or blog. Simplified Recipe is a plugin for WordPress that allows you to effortlessly manage and administer all of your recipes. Whether you want to categorize, filter, display recipes on your site via a built-in shortcode, share your recipes, or even allow visitors to rate them – this plugin offers it all. Recipe Box allows you to embed recipes on your site easily and effortlessly with this powerful and robust WordPress plugin. Include a picture, list ingredients, list step-by-step directions, allow visitors to rate/review recipes, and it has integrated Schema.org (rich snippets) which provide extra information to the search engines. Le Chef includes everything you might want or expect from a premium recipe plugin… and more. Features: filter/search box for recipes, print and/or share recipes, full-screen mode, custom dashboard, user accounts (that display favorites, submissions, and more), custom “most-liked” recipe widget, measurements and recipe types, cooking/preparation time, ingredients and step-by-step directions, custom photo/image gallery, built-in calorie counter, and more. Cooked is a powerful (and beautiful) free WordPress plugin for recipes. Features include: easy-to-use and implement, optimized for SEO, Schema.org and rich snippets, preparation and cooking times, nutritional information, interactive timers, filter recipes by type/person/category, photos, and more. WP Ultimate Recipe is a plugin that allows you to easily display recipes on your website or blog. With dozens of features from shortcode use to nutritional information, the thousands of downloads and stellar ratings have made it one of the most-downloaded plugins of its kind. Whether you’re running a food blog, setting up a cooking website, or adding functionality to an existing website or blog – displaying recipes in an easy-to-view and easy-to-setup manner can be a little bit of an undertaking. While standard WordPress posts would allow you to insert recipes with formatting that you choose, sometimes it’s easier to take advantage of existing solutions so you can maintain a standard and cohesive look, format, and style. Fortunately, there are many excellent WordPress plugins for recipes that can do all of the heavy lifting for you. Not only can they help you maintain a standardized look, but many offer extended features (like Schema.org/rich snippet integration, ratings, reviews, and more). Here is a roundup up of some of the very best recipe plugins that will give your WordPress blog or website that extra kick and appeal.